At CNDLS, we support educational innovation at Georgetown through the incorporation of new technologies in the classroom, virtual learning environments, and more to create new and exciting learning experiences for students, including the ability to teach courses to students located across the world. CNDLS Senior Fellow Betsi Stephen (SFS), a veteran professor of online and hybrid course teaching, has paved the way for innovation at Georgetown through her Spring 2018 online course, “Politics and Sports” which brought together students from Georgetown’s main campus and its School of Foreign Service Qatar (SFS-Q) campus. “Politics and Sports,” an online course part of the SFS Centennial Labs, explores complex questions at the intersection of sports and politics including the political aspect of sports, and how race, gender and class are manifested in sports and politics. 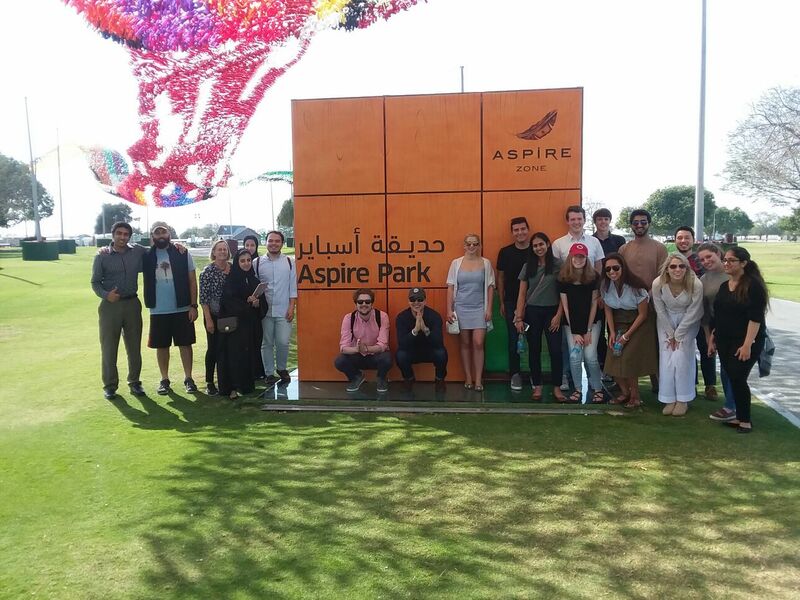 The class was composed of three undergraduate sections: 10 students in Qatar, 10 students from the main campus who traveled to Qatar for spring break, and an additional 15 main campus students who did not travel. Because of the course’s online platform, students were given the unique opportunity to interact and hear from peers from across the world with vastly different perspectives, and to go at their own pace each week. As part of the course requirements, students were required to complete a group project. Over spring break, the 10 main campus students traveled to Qatar to present their projects and explore the country. Throughout the course of the week, students from both campuses had the chance to engage with one another and gain a better understanding of each other’s region and culture. The ability to engage beyond the online learning space gave students the unique opportunity to see the real world applications of their coursework through the study abroad component. It allowed for an enriching cultural experience and the chance to develop valuable skills like cross-continent collaboration from the need to coordinate across different time zones for their group project. 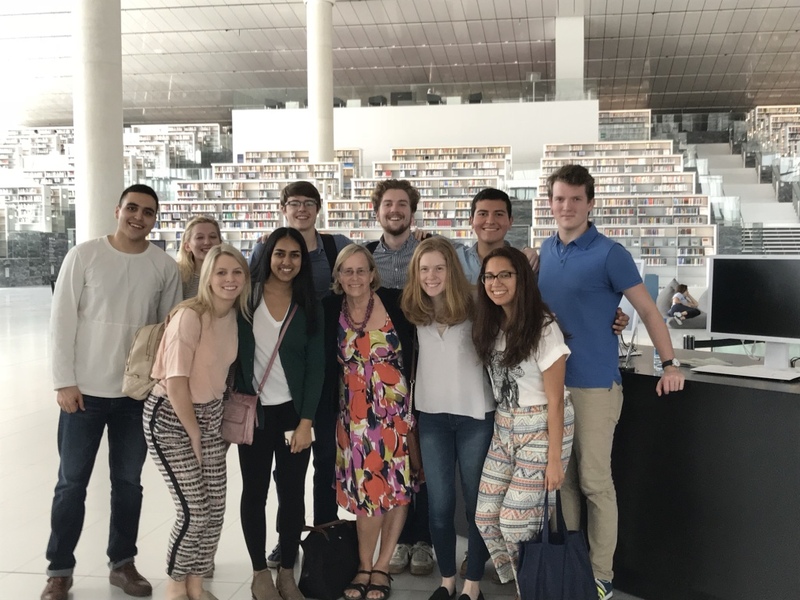 To learn more about Stephen’s course and her students’ experiences, read the full blog post from the School of Foreign Service here. We extend our deepest congratulations to Stephen on the success of her innovative course. We look forward to future courses like this one! To learn more about how you can engage with CNDLS’ programs and services, visit our website or contact us at cndls@georgetown.edu. 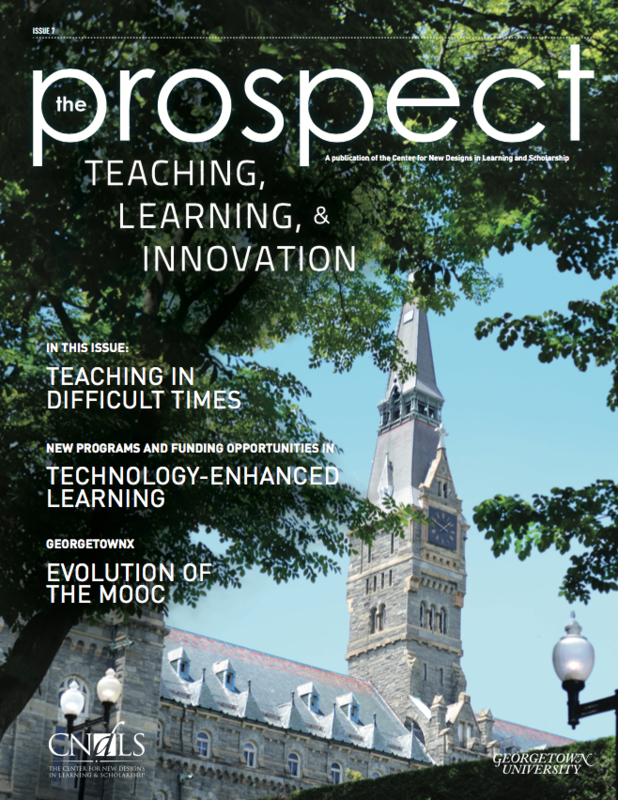 At CNDLS, we support educational innovation at Georgetown through the incorporation of new technologies in the classroom, virtual learning environments, and more to create new and exciting learning experiences for students, including the ability to teach courses to students located across the world. CNDLS Senior Fellow Betsi Stephen (SFS), a veteran professor of online and hybrid course teaching, has paved the way for innovation at Georgetown through her Spring 2018 online course, “Politics and Sports” which brought together students from Georgetown’s main campus and its School of Foreign Service Qatar (SFS-Q) campus. “Politics and Sports,” an online course part of the SFS Centennial Labs, explores complex questions at the intersection of sports and politics including the political aspect of sports, and how race, gender and class are manifested in sports and politics. The class was composed of three undergraduate sections: 10 students in Qatar, 10 students from the main campus who traveled to Qatar for spring break, and an additional 15 main campus students who did not travel. Because of the course’s online platform, students were given the unique opportunity to interact and hear from peers from across the world with vastly different perspectives, and to go at their own pace each week. As part of the course requirements, students were required to complete a group project. Over spring break, the 10 main campus students traveled to Qatar to present their projects and explore the country. Throughout the course of the week, students from both campuses had the chance to engage with one another and gain a better understanding of each other’s region and culture. The ability to engage beyond the online learning space gave students the unique opportunity to see the real world applications of their coursework through the study abroad component. It allowed for an enriching cultural experience and the chance to develop valuable skills like cross-continent collaboration from the need to coordinate across different time zones for their group project. To learn more about Stephen’s course and her students’ experiences, read the full blog post from the School of Foreign Service here. We extend our deepest congratulations to Stephen on the success of her innovative course. We look forward to future courses like this one! To learn more about how you can engage with CNDLS’ programs and services, visit our website or contact us at cndls@georgetown.edu. Posted June 18, 2018 by Katherine Grygo & filed under Innovation.